I am a little bit obsessed with pool noodles this summer. I like to buy at least one or two in every color. 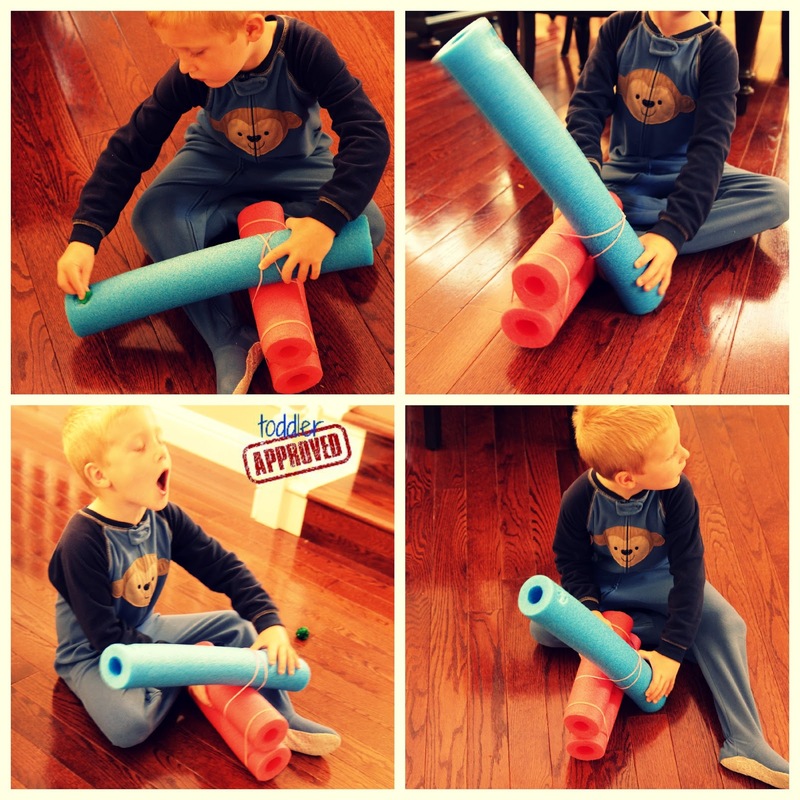 My kids don't actually like to use them in the pool- except when we do pool noodle learning activities... so we have a lot just hanging out. 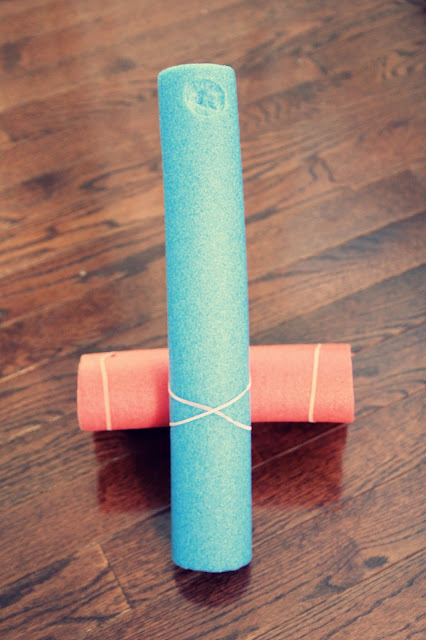 Since summer is wrapping up, we've been trying to do some projects with the last few pool noodles we have lying around. Last week we made a pool noodle water wall along with a marble run. 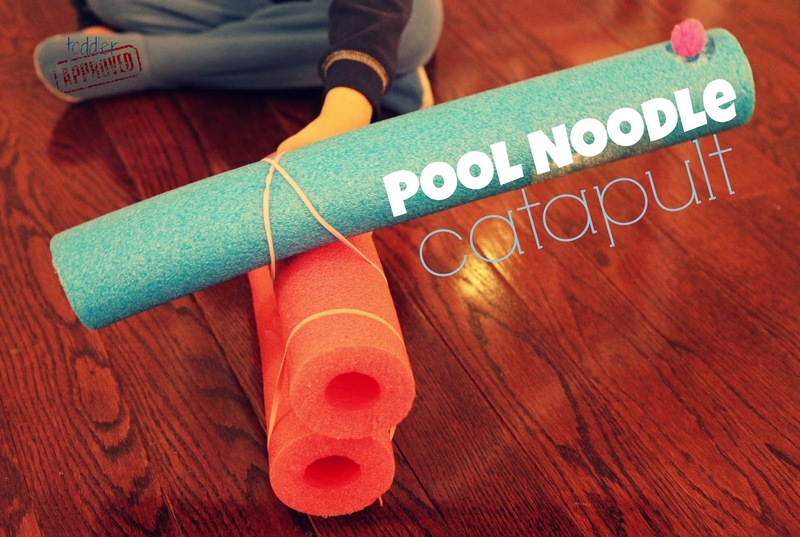 Over the weekend we decided to use two pool noodles and some rubber bands to make a pool noodle catapult. First we trimmed the pool noodles in half. Then we used 3 out of 4 pieces for our catapult. 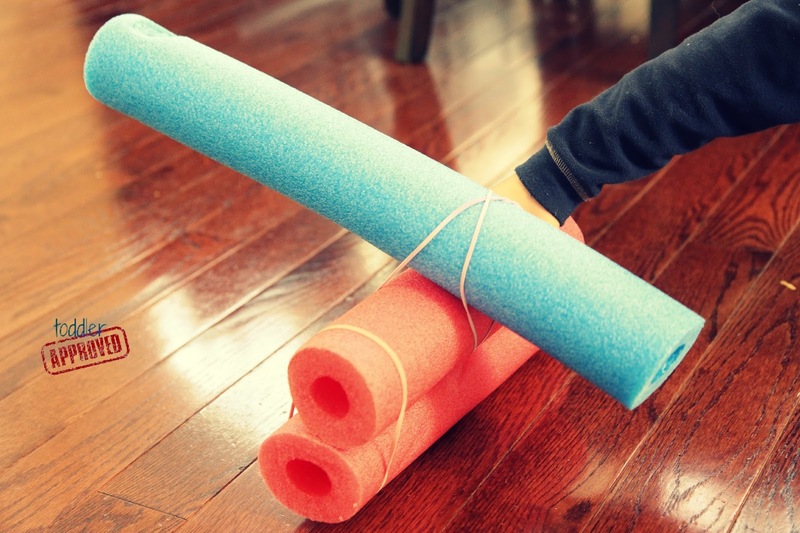 We attached two noodles together with a rubber band on each end to make a short pool noodle stack (pictured below in red). Then we used a knife to cut out a small circular indent on one end of the other pool noodle (pictured in blue). This indent was the spot for our pom pom to rest. Lastly we took the unattached noodle and attached it to top of the stack of noodles using two rubber bands... which crossed to make an X. We pulled the noodle in place so that the side with the pom pom hole was longer and the other side was a bit shorter. Next we placed a pom pom in it's position, pushed the short side of the blue pool noodle down while holding the red stack of pool noodles in place... and voila! We launched our pom pom across the room! We played around with the noodles again and again to try and figure out the best way to position them so that our pom poms could go the farthest. The funniest part of this activity was how desperately the baby wanted to get the pom poms. As my son launched them we had to run around and grab them before the baby stole them first and tried to eat them. It definitely kept us moving and on our toes! Do your kids love launching things? This is a fun activity to use to teach science and math concepts... while having a great time making things fly! Catapults teach about motion and forces in simple ways. Once you've created a catapult you can do different experiments to figure out which materials fly better, how much force is needed to launch an object, etc. Also, if you missed it... we announced our Virtual Book Club for Kids authors last week for 2013-2014. Come check out the list and tell me which author you are most excited about. Ok, this is just FUN! !